TrumpFans.com is an unofficial fan site created by one of Trump’s Twitch.tv’s mods, ButterMyBiscuit. 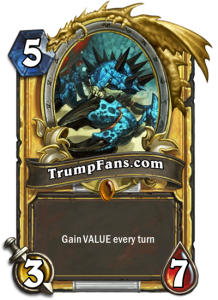 The motivation behind the site is primarily to provide a better way of displaying Trump’s latest Hearthstone decklists. Previously, decks were displayed in text files on hastebin, which isn’t the most user-friendly way to share decks. Prior to that, they were hosted on google sites, but due to a variety of factors, decks were not being updated and maintained there. 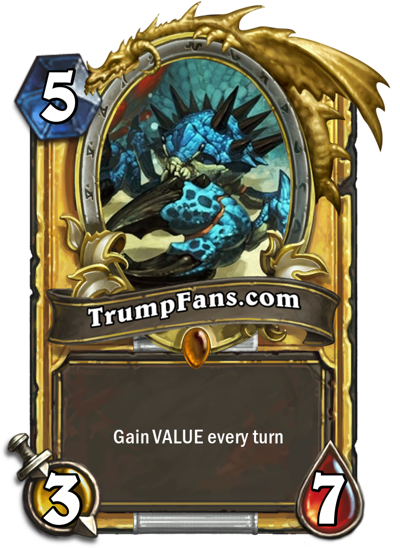 The hope is that TrumpFans.com will make it easier to keep Trump’s decklists up to date. Going forward, there may be an opportunity to expand the content on this site, but providing decklists is the initial goal. Why is this considered an “unofficial” site? While Trump is aware of this site, he doesn’t own the site, and he isn’t responsible for its content. As such, if you have questions/comments/feedback about the website or its content, please don’t bug Trump about it, as it’s unlikely he’ll know what you’re talking about, but instead please send them to feedback@trumpfans.com. Thanks! Interested in advertising on TrumpFans.com? Inquiries can be sent to ads@trumpfans.com. Follow Trump Fans on social media and keep up to date with all the latest Trump-related news!